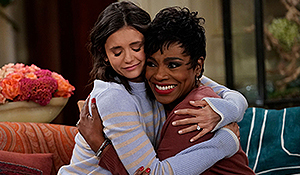 FAM stars Nina Dobrev and Tone Bell in a comedy about a woman whose vision of a perfect life with her adoring fiancé and his wonderful parents is radically altered when her 16-year-old, out-of-control half-sister unexpectedly comes to live with her. As the family Clem (Dobrev) chose and the family she has blend, Clem realizes that this new happy fam may be the perfection she’s always been seeking. Odessa Adlon, Brian Stokes Mitchell and Sheryl Lee Ralph also star. It was tape night yesterday and of course there are Behind the Scenes photos from rehearsals this week and yesterday along with videos so check out all the goodies below.